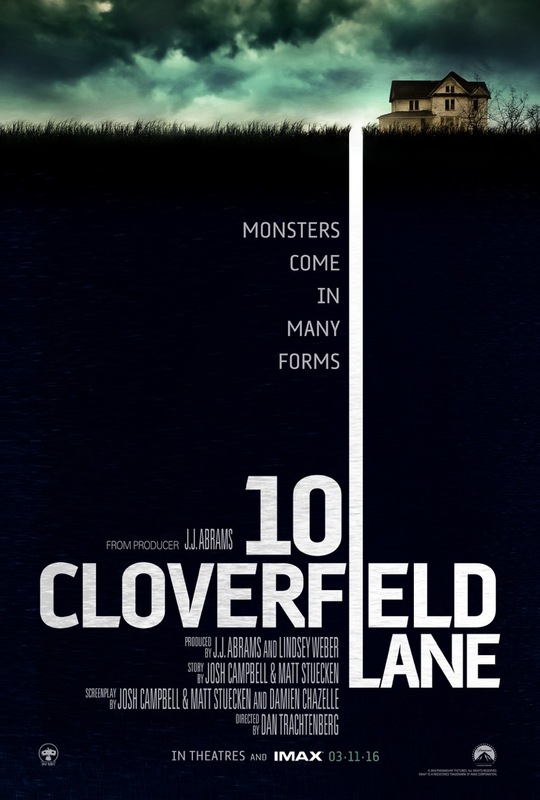 10 Cloverfield Lane had such an engrossing marketing strategy that I was worried it would follow the same path as Deadpool from earlier this year; AKA great marketing scheme, lackluster film. Just a reminder, 10 Cloverfield Lane only became known in the middle of January, roughly two months before its release. According to rumours, even lead actress Mary Elizabeth Winstead wasn't aware of the film's title until the day the first trailer premiered. The marketing scheme also left no impression whatsoever as to where this film fits in with 2008's Cloverfield - one of very few found footage films to actually do the format justice. It was an undoubtedly bizarre strategy, but it was wildly effective. Much like they were back in 2008 when this word became an internet sensation, this January everyone was talking about one thing: Cloverfield. But here's the thing: how many sequels (be it spiritual or conventional) are considerably smaller than their predecessor? I can't think of many. Cloverfield was a monster movie on a massive scale; 10 Cloverfield Lane spends most of its time in a bunker. Whilst driving away from her boyfriend, Michelle (Winstead) is involved in a car crash. When she awakens she is laying on a mattress in a dingy room, with her ankle chained to the wall by a man named Howard (John Goodman). He claims that something has made the air above ground toxic and that the only safe place is the bunker, a claim reinforced by traditionally nice guy Emmett (John Gallagher Jr.) who had previously fought his way down to the bunker. The film is then about whether Michelle can trust Howard, who Howard really is, and what is actually taking place above ground. It's a thrilling setup, and the film's opening is paced exceptionally well. Michelle is in her car speeding down the highway within minutes, but in one brief moment of distraction her car is sent tumbling down a hill - cutting only briefly to silently display the film's opening titles. Before we can catch our breath, Michelle awakens in the bunker, and things just get worse from there. 10 Cloverfield Lane's greatest asset is unquestionably its atmosphere. The minute we first see the bunker, something doesn't sit quite right. Even after Emmett backs up Howard's claims, and even when Howard is revealing his past to Michelle in a moment of vulnerability, there's this constant feeling that the ceiling could cave in - literally and figuratively - at any second. There's never a moment of comfort. Cinematographer Jeff Cutter and director Dan Trachtenberg do a superb job of allowing the tension and the stakes to rise subtly as the film progresses; before you even realise it, a character you're surprisingly well connected to is crawling through a narrow vent in a seemingly safe scenario, but you wouldn't be surprised if a bomb went off there and then. Shot predominantly in close up and mid shots, the frame is consistently kept tight; corners lurk at the very edge of the frame leaving entrances and exits consistently open for a sudden change in scene direction, while characters' faces frequently fill most of the frame creating an alarming sense of claustrophobia. Even while the three leads sit at the dinner table discussing Monopoly, it's difficult not to feel the tension building on your shoulders. This is all benefited by the film's excellent cast. Winstead is truly magnificent from beginning to end: she is, by my calculations, in every scene of the film bar one, and she gives a compelling performance throughout. Michelle is essentially the audience's viewpoint, and Winstead handles this responsibility more than capably. Goodman is also terrific, he is equally as menacing with his glares as he is when he loses control of his anger. He yells so close to the other characters' faces and with such tight framing that you can almost feel his spit landing on your cheek. If Winstead acts as the film's emotional connection and perspective, Goodman is the opposite: even in his nicer moments, if the film has a villain, it's him. Gallagher Jr isn't given as much material to play with as his co-leads, but he still does an admirable job of keeping Emmett a likable character. He is far and away the funniest member of the cast, in fact I was quite surprised as to how funny 10 Cloverfield Lane was. For a film so unbearably intense, there's a great amount of humour here, and it all nails the landing perfectly. And then, the film completely changes. What was once a chamber piece set entirely in one underground bunker becomes an explosive, high-wire act in the blink of an eye. The film begins as a drama, then slowly conforms it's way into small-scale thriller territory, but also packs in a hefty amount of sci-fi, and horror. Trachtenberg has taken on so many genres in his directorial debut that the whole film should be a complete mess, but it's actually the opposite. 10 Cloverfield Lane is an astonishing film in a number of ways: it's tight, it's focused, and it is more than capable of taking the very character driven tension to heights you never imagined were possible. The film's final reveal - which takes up the closing fifteen minutes - certainly won't be to everyone's taste (it is almost a completely different film), but I loved it wholeheartedly. A whole load of possible endings run through your mind when watching 10 Cloverfield Lane, but it's impossible to place a firm bet on any of them. It is, of course, entirely possible to guess where the film is headed, but even with a guess of pinpoint accuracy, you won't be able to predict the ways in which the film executes it. To Summarise: Excellently crafted and well performed across the board, 10 Cloverfield Lane is a great example of how to masterfully combine a number of genres and create something both refreshingly original and entirely unpredictable.